Huddle House is a 24-hour diner-style restaurant with over 390 locations in 21 states. The chain was started in 1964 in Decatur, Georgia and started franchising in 1966. Huddle House’s human resources department came to Barta Media Group in need of a way to list job opportunities on their website that would be user-friendly for both job seekers and administrators. 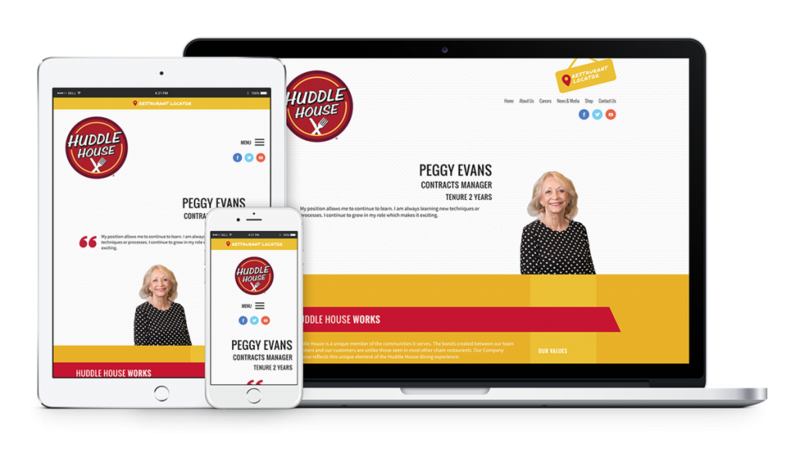 One of the biggest hurdles for the project was that Huddle House’s existing website did not have the technology needed for an HR administrator to easily list job postings. Instead, it required a developer to go into the site and use code to list the available position. This required additional time and a special skillset to perform a seemingly simple task. Huddle House wanted to correct this by simplifying the process so that someone with basic computing skills would be able to list an available position. There was also no way for users to filter job postings based on location, department, or any other criteria on their current website. 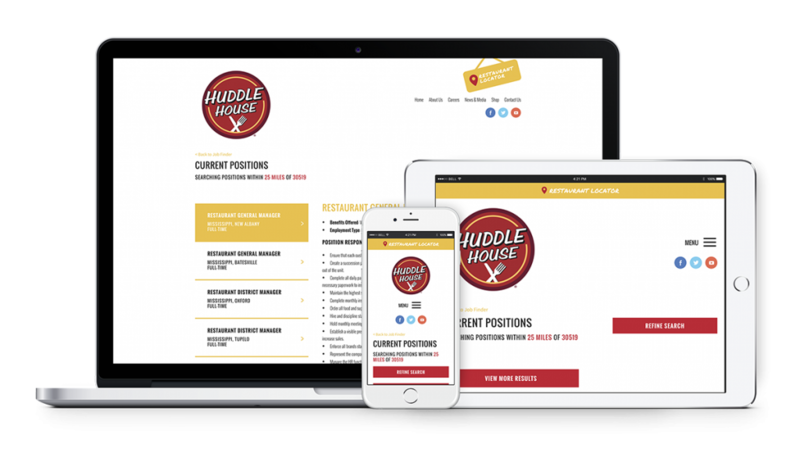 Huddle House wanted their job search process to be as simple as possible and appeal to workers. 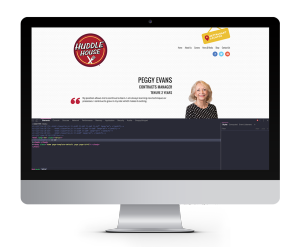 Because Huddle House’s current website was not built on a Content Management System (CMS), we had to use a new domain, HuddleHouseCareers.com, to host the page. The new domain was then integrated into Huddle House’s current sitemap so that it would bypass the current careers page. We decided to build the new domain on WordPress, an easy-to-use CMS that would allow administrators with basic computing skills to easily update job postings. Having this capability would make the process simpler as well as save the company time and money. Because most people use smartphones for internet browsing, we made the website responsive so that it would fit perfectly on mobile and tablet devices. To simplify the job search process, we designed a geographical map of the US so that users could click on their state and be shown available positions in their area. 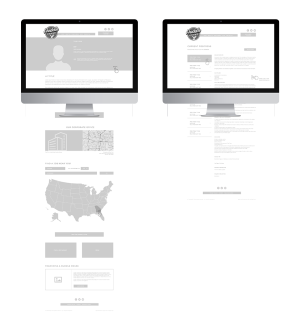 The website was made using a simple two-page architecture: a careers page and a job listings page. 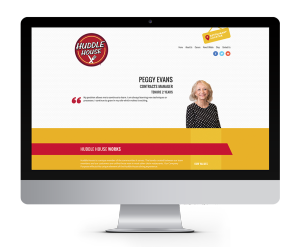 The careers page contains information about the Huddle House values, a quick job search form, and an opportunity to learn more about franchising. The job listings page displays available positions on the left-hand side and information about the position on the right. Once a user is ready to apply for the position, they simply click on the APPLY NOW button and are taken to the application page. We also included a REFINE SEARCH button so that job seekers can be more particular with their search. Using this two-sided model, users can easily scroll through job postings, learn more about each position, and submit their application using a simple and fluid interface. When a user first lands on the website, they are greeted by a sliding banner that rotates through photos of current employees. To the left of the photos are quotes explaining what each employee likes most about working at Huddle House. This shows visitors the faces of the company and helps give the page some personality. The rest of the website follows a paneled layout. The second panel helps to explain Huddle House’s brand and the values it looks for in its staff. The third and fourth panels are images of the Huddle House corporate office and one of the original Huddle House restaurants. The next panel is a quick job search form, followed by a color-coded map of the US. States that are highlighted in yellow indicate that a Huddle House in that state has posted a job opening. States highlighted in grey, however, do not have any job postings. The entire site uses Huddle House’s brand colors, but we decided to give it a flatter design as well as add some brick texturing to some of the panels. Because we built the website on WordPress, someone with absolutely no coding skills can make changes to the website. This means that an in-house administrator should have no problem updating content or posting job listings to the website. We built the job listings page using AJX so that when a user clicks on a position to read more about it, the job description loads dynamically on the page. This way the user doesn’t have to wait for the entire page to load each time they click on a position. AJX also runs a call to Google maps’ API to show job positions for a specified zip code with a designated mile radius. 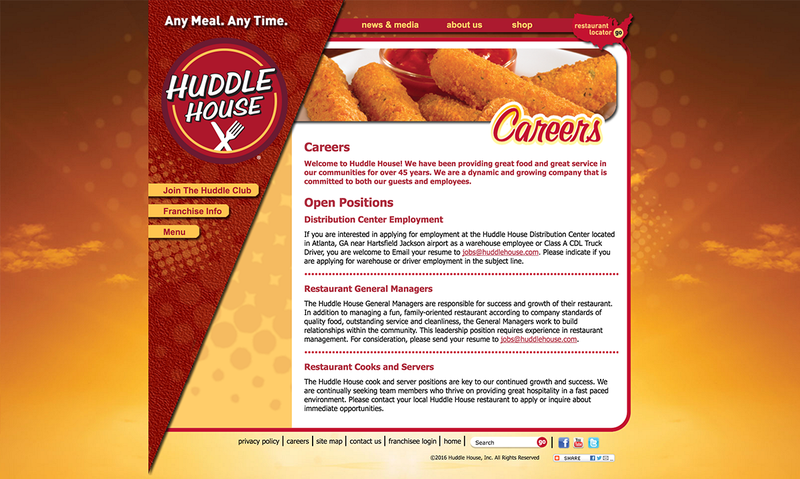 HuddleHouseCareers.com is a huge improvement from Huddle House’s previous careers page. Job seekers can now search and filter through open positions with ease. Every page loads quickly and fluidly, making for a great user experience. I truly enjoyed working with Barta Media Group. They really listened to my needs and implemented them into the finished product. The project process is very complex but the team was very thorough in their explanations. There were also regular progress check-ins. Our new careers site is easy to use and maintain. Barta Media Group really provided a great solution to our talent acquisition needs.